Built by Curtiss in Buffalo, New York. Constructors Number 29677. At the factory, this aircraft was intended for delivery to the Republic of China Air Force (ROCAF) and painted in Nationalist Chinese markings. Instead, delivered to the U. S. Army Air Force (USAAF) as P-40N-5-CU Warhawk serial number 42-105915 and overpainted with U. S. markings. Disassembled and shipped to Australia and reassembled. Assigned to the 5th Air Force, 49th Fighter Group, 7th Fighter Squadron. Assigned to pilot Robert Warren, whose name was painted on the side of the cockpit. This P-40 operated in New Guinea until abandoned at Tadji Airfield. Until 1974, this aircraft remained standing on its landing gear at Tadji Airfield with the engine removed. During 1974, this P-40 was salvaged by Charles Darby and transported by barge to Lae where Monty Armstrong exported it to Auckland, New Zealand. During 1974, sold to Australian Malcolm Long who shipped it to Australia. 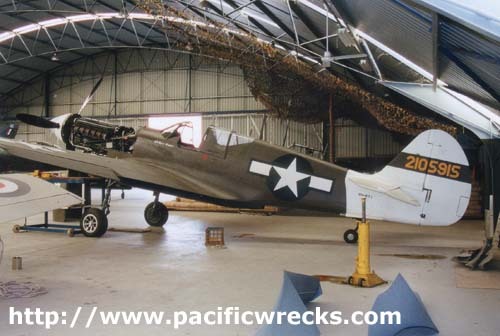 Initially, this P-40 was purchased by Australian Malcolm Long who owned it until 1988. Ownership during 1988-1991 is unknown. In 1991, acquired by Jack McDonald and John Rayner. Next, in 1997, purchased by Murry Griffith / Precision Aerospace. During 2008 to th, sold to a buyer in France who remains the owner today. Since the late 1970s, this P-40 was displayed at a variety of locations in Australia in both private collections and museums. During 1977, displayed at RAAF Museum Point Cook. During 1980-1985, displayed at Chewing Gum Field Museum then displayed during 1985-1991 at Air World at Wangaratta Airport. Since 1974, this P-40 was restored in Australia on the Gold Coast by several different companies and people over the years, including Ron Lee. 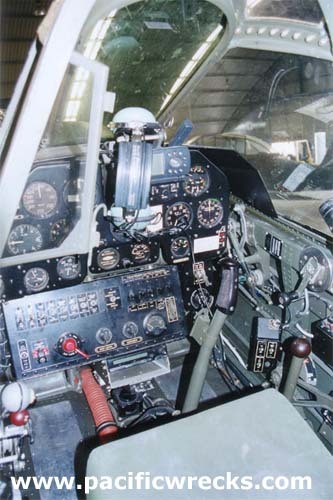 In 1997, Murry Griffith / Precision Aerospace continued restoration work. The first flight was during 2002. Registered in Australian as VH-KTI. At the time, this was the only airworthy P-40 in Australia. In September 2005, Robert Warren, the former pilot visited this aircraft at Precision Aerospace. His visit was covered by Australian television news. During 2008, sold to a buyer in France, disassembled and shipped overseas arriving by February 2008. In June 2008, this P-40 made its European debuted at the La Ferté-Alais air show near Paris. Since then, it has flown in the European air show circuit.